This was the week Belgium stole England’s thunder and Elon Musk stole a farting unicorn. Now magazine published this car crash of an interview with Gemma Collins as she tries to promote her new book, which is about…well, have you read her new book? You should read it. …and it turns out she’s also surprised by screens. A lot of screens. Take a look at the full compilation while appreciating the many hours someone spent on stock photo sites. 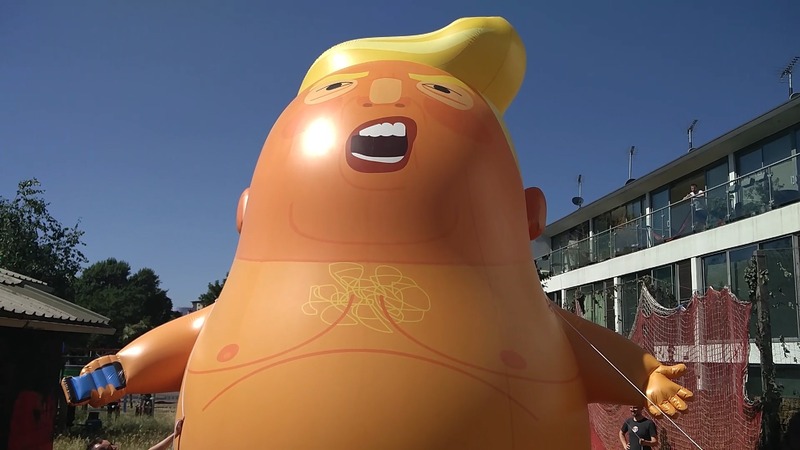 Protestors crowdfunded this big ‘Baby Trump’ balloon to greet the US President when he visits on 13 July. And just in case Trump doesn’t get the message, there’s potential for the balloon to go on tour. What Does Trump Think of David Lynch Films? Talking of Trump, he’s having weird banter with weird filmmaker David Lynch. And this has made us wonder what Trump thinks about his films, if he ever had the patience to watch one*. So, thank god The Guardian have imagined this for us. We think Mr Bean could’ve done a better. *I mean who would blame him. Have you seen Inland Empire! ?